We Hope you enjoyed our course. To show our appreciation for you attending our Concealed Handgun Permit Course we are offering you, for a limited time Half-Priced Gift Certificates to our Concealed Handgun Permit Course that you can give to your Friends & Family to attend our course as well. With the current high demand for our courses due to recent events and the possibility that there could be more events in the future, these Gift Certificates for our Concealed Carry Permit course will be a useful and appreciated gift. Many people take our courses just for the information on firearms safety that they will receive during the class. Knowledge = Safety! We have no set age limit in our courses but have found that mature teenagers can get beneficial information from our class as well. (Under 18 must be accompanied). 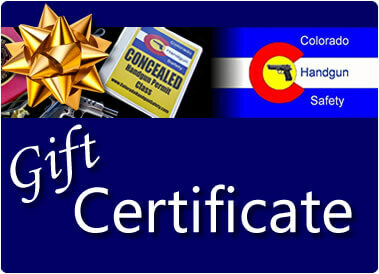 The Colorado Handgun Safety Gift Certificate is redeemable for admission to a regularly scheduled Concealed Handgun Permit Course that we offer along the Front Range of Colorado. The Gift Certificates will be mailed via USPS to you as soon as we get your order. Gift Certificates are valid for one year from the date of issue for admission to a class, after one year the full purchase price may be applied to the cost of the course tuition for up to 5 years. The Certificates are Non-refundable but fully transferable to anyone you give them to. Order Now as this is a limited quantity / time offer. We Hope you enjoyed our course. To show our appreciation for you attending our Concealed Handgun Permit Course we are offering you, for a limited time Half-Priced Gift Certificates to our Concealed Handgun Permit Course that you can give to your Friends & Family to attend our course as well. With the current high demand for our courses due to recent events and the possibility that there could be more events in the future, these Gift Certificates for our Concealed Carry Permit course will be a useful and appreciated gift. Many people take our courses just for the information on firearms safety that they will receive during the class. Knowledge = Safety! We have no set age limit in our courses but have found that mature teenagers can get beneficial information from our class as well. (Under 18 must be accompanied). The Colorado Handgun Safety Gift Certificate is redeemable for admission to a regularly scheduled Concealed Handgun Permit Course that we offer along the Front Range of Colorado. The Gift Certificates will be mailed via USPS to you as soon as we get your order. Gift Certificates are valid for one year from the date of issue for admission to a class, after one year the full purchase price may be applied to the cost of the course tuition for up to 5 years. The Certificates are Non-refundable but fully transferable to anyone you give them to. Order Now as this is a limited quantity / time offer.